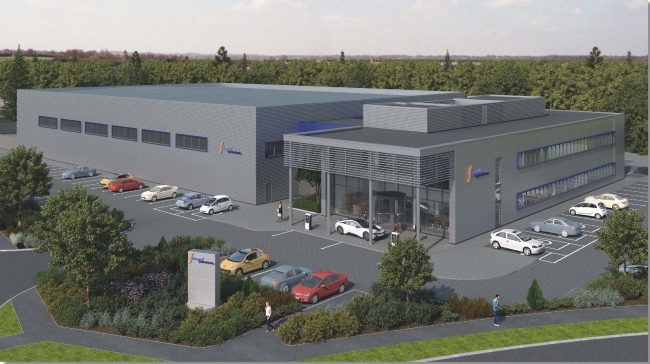 Market leading powertrain and e-Drive solutions provider Integral Powertrain is investing in a three-acre site which will see the company build a new state of the art Technical Centre in Milton Keynes. The company’s recent success has seen it outgrow its existing locations and expansion has become necessary to ensure the levels of service and quality their customers have come to expect is maintained. Planned to be operational by Q3 2019, the new facility represents an initial investment of £6M, excluding facilitisation, and more than a doubling of the floor area to 47,000 sq. ft. compared to the existing Technical Centre and its annex. The company also said there is potential to further increase this by internal expansion to 59,000 sq. ft.
Once fully operational, the facility will cater for over 250 staff. A twin link connects the offices to a large workshop, which houses 8 new purpose build test cells with support areas, material handling, inspection, machining facility, electrical and mechanical prototype build and a low volume production manufacturing area as well as zones reserved for 4 additional cells. The new site will allow for further growth and expansion to mirror future business expectations and Integral Powertrain’s upgraded vehicle emissions and climate test facility will remain at its existing location also in Milton Keynes. Integral Powertrain is at the leading edge of their industry and continues to invest in R&D to maintain technical leadership and extend the boundaries of what is possible with electric machines. At its heart are its employees.